What do you notice about the photo above, aside from the bevy of hen do-attending ladies clambering over Eros, and the rare spectacle of London in sunshine? Yes, I am not reading on my beloved Kindle, but on my phone – and that is because I left my Kindle on the Newport to Paddington train. WOE. I really do have the most appalling luck when it comes to Kindles – since I first got one in July 2011, I’ve gone through… maybe eight or nine of them? A number of them (maybe four or five) fell prey to the screen-freeze that I think was quite common in the early cheap models; I dropped my laptop on one (yes, I know), and had another one stolen out of my bag (while I was being held in transit in Tashkent Airport, prior to being booted out of the country), and now this. I will of course IMMEDIATELY buy another, because I cannot get by without hundreds of books at my fingertips. Still, I was quite proud of myself for having held onto that particular model for nearly a year, having bought it just before moving to Cairo last year. Sad. Thank god for free Kindle apps, though, because it would have wounded me to have to stop in the middle of this book. People are (often) insufferably snobbish about Stephen King, but I (mostly) think he’s a goddamn genius – with a pleasantly non-pretentious attitude to his own writing. I’ve not read a lot of books about writing, but I can’t imagine they come much better than King’s On Writing; when it comes to fiction, King at his best (The Shining, Doctor Sleep, Hearts in Atlantis, The Stand) is as good as anyone else writing today. Plus he wrote The Dark Tower, which I read in January this year and absolutely adored, flawed as it is in parts. Mr Mercedes, I think, is one of his better books – a fairly straightforward detective novel with a very likeable protagonist and an enjoyably unpleasant antagonist (as well as two of the most interesting sidekicks I’ve seen). I’d sensibly pre-ordered it so it appeared as if by magic on my Kindle (pre-loss), and I have done likewise for Revival, King’s next novel, which is due out towards the end of the year. Can’t hardly wait. London, eh? I’m from London, but haven’t lived there since 2007, and every time I visit it stirs up a potent mix of nostalgia, longing and RAGE (the latter usually provoked by trying to go anywhere by public transport). 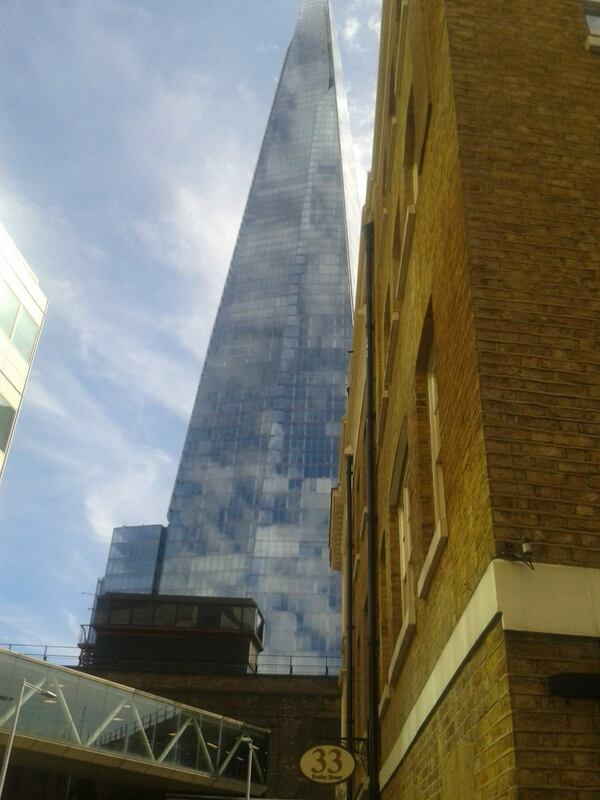 The Shard, however, never fails to provoke the simplest kind of childlike delight in me, whenever I see it.